There’s nothing like a seashore hunt for glass floats at 5 AM on a misty April morning. We learned that in Lincoln City every year from mid-October to Memorial Day local artisans distribute beautiful hand-blown glass floats along the coastline for eager tourists to discover. And I’m not talking a dozen or so. They leave thousands! As many glass floats as the year number. For those of you who are still in doubt, 2015 numbered glass balls—all brilliantly colored and expertly crafted—will be distributed along the Lincoln City beaches this coming year. I’d love to join you in the hunt. We guessed the artisans would distribute the floats on the far-flung reaches of the area in order to spread tourist searchers more widely up the coast. Wrong. Apparently the glass blowers weren’t as enthusiastic about braving the misty April morning as we were, and stuck to the central part of Lincoln City’s coastline. Empty-handed, we resorted to the glass shops. And yes, there were beautiful hand-blown glass balls for purchase everywhere. These were not numbered like the freebies on the beach, but the one we bought is just as beautiful. 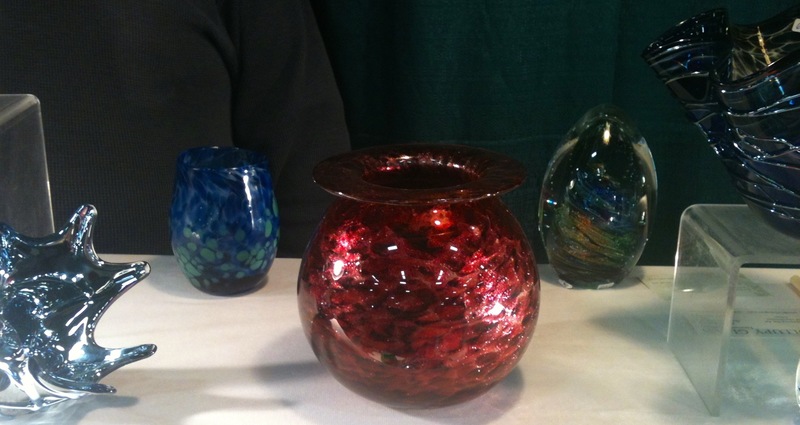 The shops also featured every other possible item that can be made of glass, from jewelry to goblets to lamps. Next time I come, I’ll sign up in advance for some glass-blowing lessons. 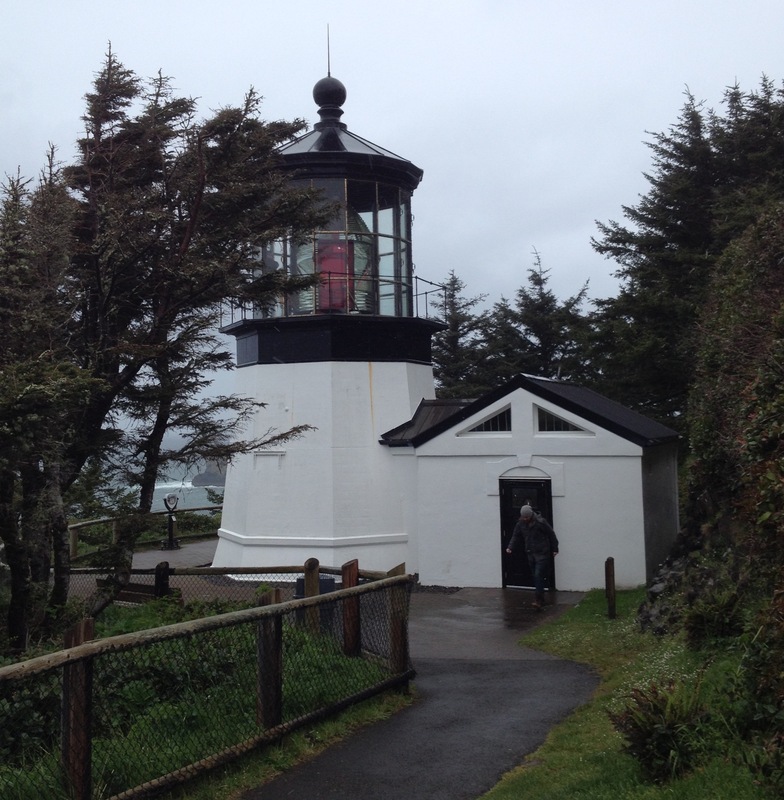 We drove north from Lincoln City on Highway 101 along the edge of the Siuslaw National Forest. Bucolic scenes of contented cows in verdant pastures culminated at a notable pilgrimage point—an ice cream cone at the Tillamook Cheese Factory. I think they should give visitors huge cones for small coinage since we went to the effort of getting there. Not so. Oh well! 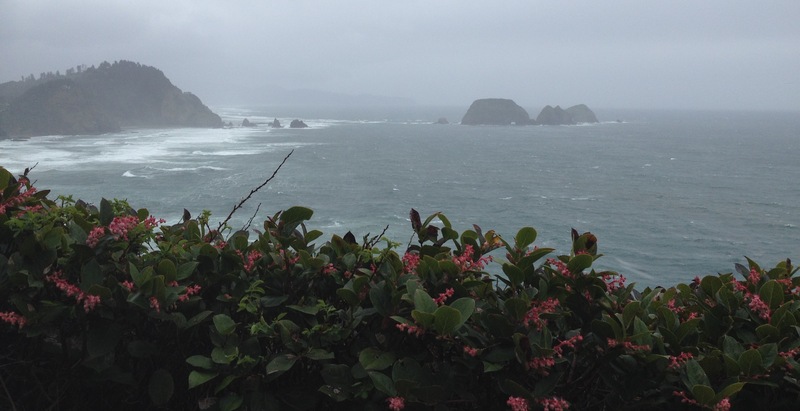 The morning mists turned into blustery rain-laced wind as we turned westward toward the coastline and Cape Meares. 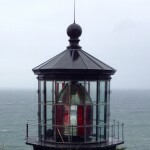 The lighthouse isn’t very tall, in fact at 38 feet it’s the shortest along the coast. At one point while on the path clutching the railing and trying not to look down at the churning sea below, my daughter turned the video camera on me and tried to get my attention. The wind blew her words away from me so completely that at a ten-foot distance, I couldn’t hear a word she said. We changed direction and walked a few hundred yards across the promontory toward the northern side. Underneath the evergreen trees, a bridal party in formal attire were being photographed. Evidently the photo-shoot was a success. Somehow the trees sheltered the event so completely that everybody smiled and nobody got wet (or blown off the headland). As we drove along the coastal road, the wind continued to whip the ocean into high frothy waves that crashed against the rocks. We dawdled at Cannon Beach to look at the beautiful vacation homes, but our destination for that day was Seaside, Oregon. Besides, I hadn’t had a good bowl of clam chowder yet that day. I called friends in Portland who directed us to Dooger’s Seafood. The restaurant was only a short walk from our hotel down into the middle of town, so we pulled our rain gear over our heads and set out. The buildings sheltered us from the wind and the rain was light by then, but that did not mean we didn’t get wet. But the clam chowder at Dooger’s was worth it. By far the best in ten days of travel in the Pacific Northwest. I wish I could say the same for the Shilo Inn Suites Hotel, Seaside Oceanfront. They assigned us to a room above the bar where a rock band had a live gig going on. Some nights of our life we’d have joined them, but we were tired. The wind and the rain had taken its toll, so after a late supper the only thing we wanted was sleep. We complained and the hotel gave us earplugs. Unfortunately that didn’t stop the vibrations we could feel in the bed. The hotel gave us a different room, so we had to transfer all of our luggage which we had unpacked before supper. Unfortunately, the new room was also over the bar, so we literally rocked with the band until midnight. It wasn’t a very good introduction to the hotel. Can’t think of a reason I’d want to go back.